What Are Foods With Simple Sugars? Simple sugars, a type of carbohydrate, provide energy for the body, brain and nervous system. Once digested, simple sugars are broken down by enzymes into glucose, the form of sugar that your body can convert directly into energy. Simple sugars -- as opposed to complex carbohydrates such as whole-grain foods, vegetables and fruit – are quickly converted into blood glucose. This creates a sudden glut of blood sugar. Problems develop when you consume more sugar than you need to accomplish your biological and physical activities. 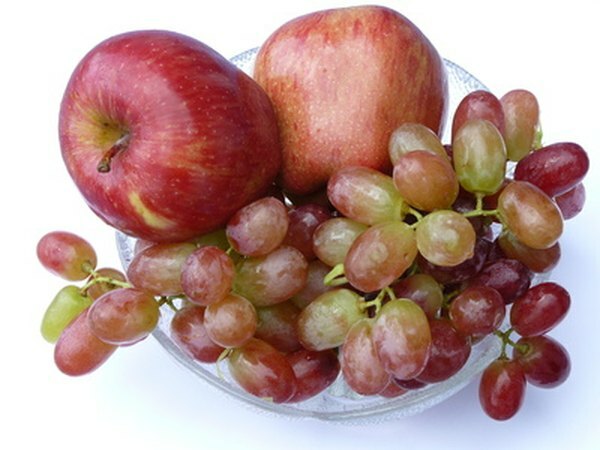 Fruit contains a type of simple sugar called fructose, which is among the sweetest of the sugars. The simple sugar that comes in fruit is delivered along with fiber and nutrients such as vitamins and minerals that enhance your body’s functioning. The fiber slows digestion, which prolongs the release of sugar into your bloodstream. This makes energy available for a longer period of time, eliminates the sugar rush, and can reduce the occurrence of quick conversion of glucose into fat because the food is less calorie-dense than many other sugar-providing foods. Fruit juices, however, don’t contain the same amount of fiber as fruit and consequently release their sugars into the bloodstream quickly. Dairy products contain the simple sugar called lactose. Less sweet than fructose, lactose nonetheless provides energy to the body. Just as the potential adverse effects of fructose are tempered by the fiber in fruit, some of the potential adverse effects of lactose are tempered by the high level of protein and other nutrients in milk. Protein slows digestion and prolongs the release of sugar into the blood. Some dairy products, such as yogurt, ice cream and chocolate milk, are sweetened with added sugars, which can lead to increased blood sugar and weight gain. Sodas contain the equivalent of up to 15 teaspoons of sugar. Unlike fruit and dairy, these calories do not come packaged with vitamins, fiber, minerals or much of anything of value to your body. On the contrary, the high levels of phosphorus in soda may leech calcium from bones, leading to dental and skeletal problems and increased risk of broken bones. Pastries, candy, cookies, cake, highly sweetened cereal and other sweetened, processed-food products contain loads of simple sugars. Examine the labels of these foods, and you will find simple sugars like fructose, corn syrup, maltose, molasses and high-fructose corn syrup listed among the top ingredients. These foods aren’t simply empty calories that lack nutritional benefit. These foods usually contain hydrogenated oils, dry milk solids, emulsifiers, artificial flavoring, food dyes and preservatives that have dubious health credentials, at best. At worst, these additives are associated with sundry adverse neurological, behavioral and health effects, according to Feingold Association of the United States.